WHAT IS CERVICAL SPONDYLOSIS & neck Pain ? To an extent, we all develop a degree of degeneration in the vertebrae and discs as we become older. As the 'discs' degenerate, over many years they become thinner. Sometimes the adjacent vertebrae develop small, rough areas of bone on their edges. The nearby muscles, ligaments, and nerves may become irritated by these degenerative changes which can cause troublesome symptoms. What is Cervical Spine ? The cervical spine is made up of small circular bones (vertebrae) stacked on top of each other. Between each vertebrae is an intervertebral disc which acts like a shock absorber and allows flexibility of the spine. Muscles and ligaments run between, and are attached to, the vertebrae. Nerves from the spinal cord pass between the vertebrae going to the shoulder, neck, arm, and upper chest. Reach your right arm over your head so that your palm is on top of your skull, your fingers resting just above the left ear. Allow the weight of your arm, along with light fingertip pressure, to gently bend the head toward your right shoulder (fig.1). Do not strain. Check to make sure your shoulders are still relaxed. You should be looking forward. Hold the pose for 30 seconds. Move your fingers toward the back left corner of your skull, this time allowing your head to bend forward and to the right, about 45 degrees in front of your shoulder (fig.2). Hold for 30 seconds. Now place your fingers at the back of your skull and gently pull your head straight forward, toward your chest (fig.3). Hold for 30 seconds. Switch hands and repeat the stretches in reverse order: Pull forward, then 45 degrees in front of your left shoulder, and finally directly over your left shoulder. Do not push your head backward. Do an isometric push against your hand to strengthen the neck. Hold your left palm against the left side of your head(fig.4). Push your left hand against your head while also pushing your head toward your left hand at about half strength. Hold for 30 seconds. Repeat with your right hand on the right side of the head. Do the same exercise, using either hand, with the back of the head (fig.5) and the forehead (fig.6). Sarvangasana (Shoulderstand) can worsen the problem. As the pose drops your chin toward your chest, it makes it very easy to completely flatten the cervical curve or even curve the neck in the wrong direction. So, if you have a fairly recent, still painful, and acute neck injury like whiplash from an auto accident, avoid Shoulderstand. It would only exacerbate the injury, and practicing it too soon could significantly prolong your healing time. Half circles in the front can be done instead. To do this, first drop your chin to your chest. Move your chin towards the right shoulder then back to your chest. Then move your chin towards the left shoulder and back towards the chest. Repeat this movement three to five times. If you continue to have a neck pain, your first task is to learn to reestablish a normal curve in as many situations as possible: sitting at your desk, standing in line at the grocery store, lying in bed.If done properly, all backward bends except Sethu Bandha Sarvangasana (Bridge Pose) engage your neck extensor muscles. Asanas like Salabhasana (Locust Pose) and Bhujangasana (Cobra Pose) � backbends in which the weight of the head is lifted against gravity � provide the most strengthening benefits for the back of the neck muscles. However, as you practice these asanas, see that you pull your shoulder blades away from your ears and do not to compress the back of your neck. Try to feel as if the cervical curve is distributed evenly throughout your entire neck and you're stretching your neck, even as you bend it backwards. Stand up with your feet close together. Bring your hands behind your back and interlace your fingers. Tuck your tailbone in, so you don�t arch your low back too much. As you inhale, lift your hands away from your tailbone. Squeeze your shoulder blades together and you lift your arms and stay in this position for 3-4 breaths. On your next exhale, lower your arms back down. This exercise helps strengthen the muscles in your upper back and relieve tension in your upper back and shoulders. Bring your arms straight out in front of you with your palms facing each other. As you inhale, reach your arms overhead, bringing your arms next to your ears, if you can do so without any pain. As you exhale, bring your arms back down in front of you. Repeat 4-8 times. This helps to relieve tension and build strength in the muscles in the upper back. Place the palms of your hand against the back of your head and gently press while resisting with your head. Hold for a count of ten. Repeat with your palm on your forehead. Professionals who spend hours doing desk work or in front off the computers should take small breaks in between and try and do simple neck exercises. Some of those neck pains and stiffness which does not improve in spite of exercise and medication are most certainly due to stress. When a person is in constant stress the muscles in the neck goes into spasm and causes pain and stiffness in the neck so it is very important for the doctor to identify the cause and treat it accordingly. Read more on neck pain and stiffness and learn specific neck strengthening exercises with illustrations. The symptoms may last for several months or years. Most of the time if symptoms are mild, the doctor may recommend rest, medication, and physical therapy. Rest - may need to wear a soft cervical collar or neck brace to limit neck motion to relieve nerve irritation. Medication -medications or other non-narcotic pain relievers to relieve pain and reduce swelling. For the patient to recover from cervical ailments, it is necessary that this bowel should move clearly and regularly. This medicine is very much helpful for this purpose. For patients having clear motions, this medicines should be given in a dose of 2 tablets and constipated patients the dose should be 4 tablets. If the constipation is not relieved even by taking 4 tablets the dose can be further increased to 6 tablets. At night some medicines should be given to the patients, which will act as a purgative. Sometimes patients suffering develop some anesthetic patches in the back, neck, shoulders and arms because of the pressure from nervous systems .The patient is therefore not able to feel the quantum of heat applied during fomentation. It should therefore be the responsibility of the attendant to examine the heat of the bolus before applying it on the affected parts .This fomentation should be continued about ½ an hour every day. After fomentation the affected part should not be exposed to cold wind. In winter season therefore immediately after fomentation, the affected part should be covered with some wool engarment. Surgery may be necessary if you have severe pain that does not improve from other conservative treatments. It should be your last resort as there is always a risk factor involved. Chiropractic is shown to be effective in treating cervical spondylosis. It uses gentle spinal manipulation technique to correct spinal and help to relieve nerve irritation. Spinal subluxation is the term used by chiropractic to describe the misalignment of the spinal vertebrae. 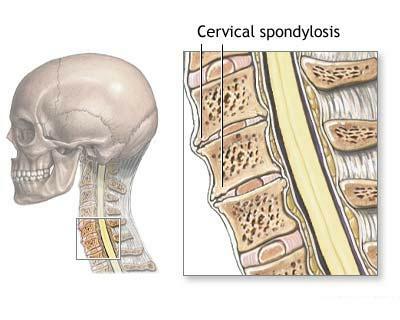 Cervical spondylosis is a treatment disease especially at its early stages. The key is to identify the degenerative condition early and seek treatment. It is important to note that bone degeneration process cannot be cured. The process can only be minimized through healthy diet and lifestyle, exercises and good structural posture. Non-steroidal anti-inflammatory (NSAIDs) Eighty-eight patients over age 40 with traumatic cervical spinal cord injuries were clinically and radio graphically evaluated, and comparison was made with 35 spinal cord injury patients under age 36. While most older patients sustained obvious bony and/or ligamentous damage commensurate with their neurological findings, 25 (28%) of the 88 patients had no demonstrable bony abnormalities and 17 (20%) of the 88 patients had only minimal evidence of bony injury. Of particular interest are the patients with severe cord injuries, yet no bony abnormalities, who seem to form a distinct subgroup of the cervical spinal cord injury patient on the basis of radiographic and clinical features. Of these 25 patients, 24 (96%) had severe cervical spondylosis. Fourteen (56%) of the 25 patients were injured in falls, five (36%) of these 14 being of a seemingly trivial nature. Of the 42 patients with minimal or no demonstrable bony abnormalities, 33 (79%) were evaluated with plain tomography and no occult fractures or other significant pathology was demonstrated. Pant opaque in 27 (64%) of the 42 cases revealed no extruded disk or other surgical lesion in any patient. In large measure, these injuries can be attributed to cervical spondylosis, which narrows the canal and makes the cord more susceptible to compression by the bulging ligament flava during hyperextension. Victims of chronic back pain were offered fresh hope with news of successful "spinal transplant" surgery. Spinal discs from accident victims were transplanted into patients with disc degeneration in the cervical spine in the cervical spine, the area nearest the neck. All reported improvements in their mobility and a reduction in symptoms such as weakness of legs and bladder. A report in the Lancet says the pioneering treatment, carried out in china, offers hope for thousands or may be millions of sufferers of severe disc problems, particularly young people. They often cannot be helped by existing treatments such as spinal fusion - which surgically joins bones in the spine, making them rigid - or artificial material to replace the defective discs. In some cases, these methods cause further degeneration of the disc above and below the area are most affected. The disc transplants were carried out by doctors at the Navy General Hospital, Beijing, and the University of Hong Kong. Although disc transplants have been carried out in primates, it is a first time doctors have reported such surgery in humans. The discs consists of cartilage that cushions the individual movements of vertebral bones. When the discs wear away or are damaged by disease, the bones press on nerves, causing pain and restricting movement. Nia Taylor, chief executive of Back Care, said "It would be very interesting to read the full details because there are a minority of people for whom a problem with discs does not naturally get better. We would welcome any new treatment that can help. The Chinese doctors used 13 discs, which was frozen and thawed out prior to transplant. Within three months the donor discs had successfully bedded in with existing spinal disc tissue. Now, five years later, all the patients show improvement and none has rejected the donor material.